Accommodates single-ply, modified membranes and BUR systems. Comes with nylon grate with screw kit, one expansion coupling and one recessed clamping ring with screw kit. Made in U.S.A. ABS plastic material provides a tough and durable product that is able to withstand construction site handling and allows the entire drain to be resistant to corrosion. 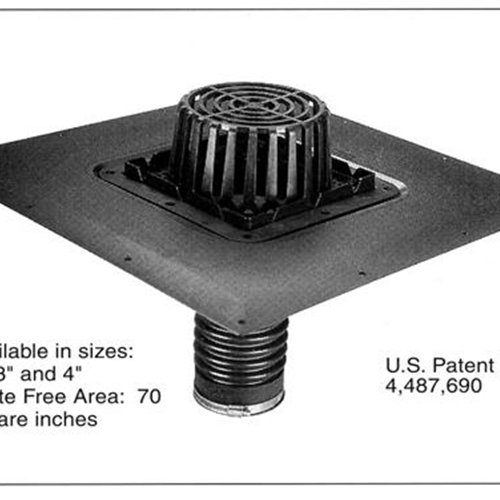 Roof drain available in 2", 3" and 4" pipe sizes. Grate free area is 70 square inches. Drain flange size is 20 1/4" W x 20 1/4" L. Drain basin is 9-1/4" x 9-1/4". These products have been listed by: I.A.P.M.O. File No. 1252, S.B.C.C.I PST and ESI Evaluation Report No. 9831A/4"